This beautiful event is the Central Coast’s inaugural Community Picnic aimed to bring members of our local community together to collectively remember and honour our deceased ancestors; to create a community event where people can talk freely and openly about death and dying, in the hope of increasing death literacy and competency around end of life and after death issues; and creating opportunities for community connections and support networks around death, dying and bereavement. Please bring your picnic blanket, yummy food, a photo of the loved one/s you would like to remember on the day, hats and sunscreen. Please no GLASS or ALCOHOL. If you would like to bring something that represents your loved one who has passed, and place it on your blanket with the rest of your family, please do. This may be their ashes (I’ll be bringing the clan!!! ), a belonging, a symbol. 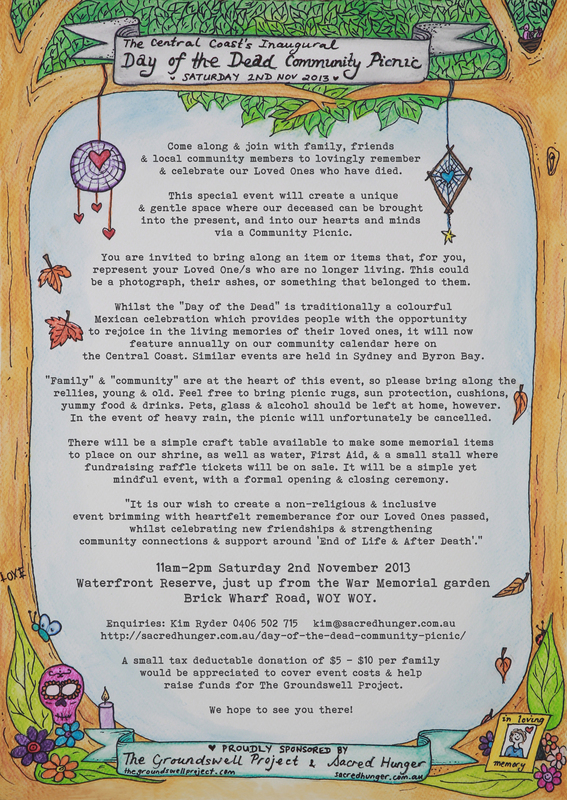 There will also be the opportunity to add a memorial item to the beautiful Moreton Bay fig tree that will be at the centre of our event. We’ll have a craft table available to make a little something to hang in the tree also. For examples of similar events, please check out http://thegroundswellproject.com/category/our-projects/festival-of-remembrance/ and http://livingwithourdead.com/archives/8. The Central Coast event will have a similar theme, but will no doubt develop it’s own unique approach and vibe. We will have a small stall selling End of Life related merchandise such as reference books (Midwifing Death and Dying To Know), Day of the Dead bags and t-shirts. We will be inviting donations of a minimum of $5-$10 per family which will help us cover the event Council application fees. 75%+ of these donations will go directly back to The Groundswell Project, and will thus be “tax deductible”. We will also be running a raffle prior to and at the event, which will be drawn at 1pm at the event. Funds raised will help buy Death Cafe Central Coast a projector, a banner, an A frame board, and hopefully some other goodies off our “wish list”. 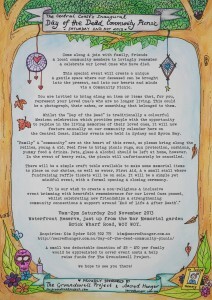 I’d like to thank The Groundswell Project who are kindly our main sponsor for the event. Without their support, it would not currently be possible to run the event at all. Thanks Groundswell. WE LOVE YOU!!!! In the event of anything more than a “light shower” on the day, the event will be cancelled – picnicing in the rain is no fun for anyone.